Mixed lineage leukemia-rearranged (MLL-r) is an acute leukemia with poor prognosis that is caused by spontaneous translocations at the MLL1 gene. MLL-r fusions bind with high affinity to the nuclear protein Menin and the Menin-MLL interaction enables leukemic transformation by driving a specific transcription program. 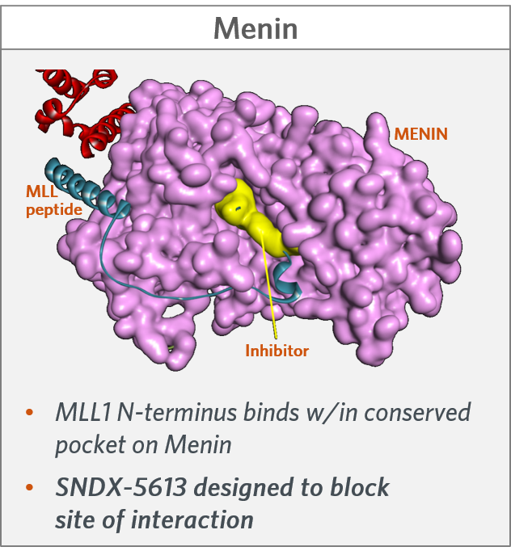 SNDX-5613 is a potent, selective, small molecule inhibitor of the Menin-MLL binding interaction that is being developed for targeted therapy in MLL-rearranged leukemias (ALL & AML). In addition, NPM1 mutant AML has high overlap with MLL-r in its leukemic transcription program and is also highly sensitive to menin-MLL1 interaction inhibitors, representing a potential second indication for this class of inhibitors. Syndax expects to file an IND and initiate clinical development of SNDX-5613 in adult and pediatric acute leukemias in 2019.